Most rowing machines in the market are made from aluminium, but the Water Rower Classic Rowing Machine has made a difference. It’s one of the few indoor rowers that’s made of wood, but it’s as sturdy as steel framed rowing machines. Boats are made of wood, and this one too, plus it’s integrated with a WaterFlywheel, so what do you get when using it? An authentic rowing experience that will make you feel just like rowing in water. Keep on reading to find out more about what the Water Rower Classic Rowing Machine has to offer! Water Rower boasts of its products being handmade in the USA. They are known to use hardwood that’s harvested in Appalachia wherein they plant more than two trees each time they cut down one. 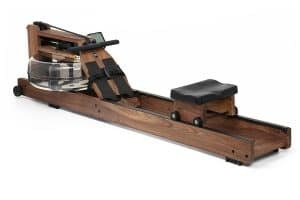 The Water Rower Classic Rowing Machine, as well as other Water Rower products, are made from sustainable materials that makes it leave a relatively light carbon footprint. Although it’s made from wood, and it’s lightweight with only 28 kg, this rowing machine is exceptionally durable. Its maximum weight capacity is 350kg which makes it the most stable in the market so far. It’s effective for weight loss, muscle training, or just to get a regular full body workout. 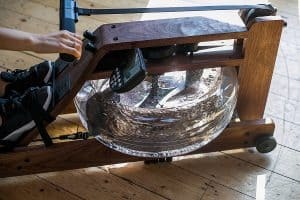 Unlike magnetic and air rowing machines, this one features a water resistance flywheel which consists of two paddles sealed in a tank of water. The water flywheel provides a natural motion, and the resistance depends on how hard you pull. This means there’s no need for artificial adjustment or resistance levels because the harder you pool, the greater resistance you’ll get. With that said, the Water Rower Classic Rowing Machine can be used by even the most novice user to a professional Olympic rower. Plus, a single stroke on this machine uses 84% of your total muscle mass, so you’re guaranteed of an efficient workout with every session. 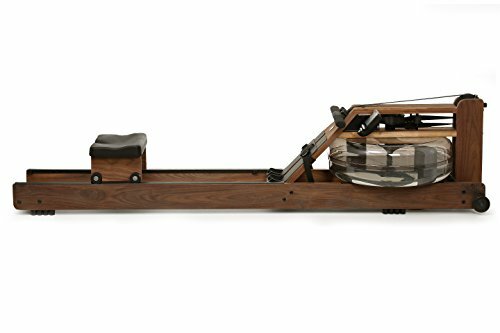 With a high-end price range, working out on the Water Rower Classic Rowing Machine will make you feel luxurious. It has a comfortable seat with dual-rail that ensures smooth and stable full strokes. The foot pedals are designed to keep your feet 5.5in apart, which is similar to rowing in an actual boat. It has foot straps which aren’t made of Velcro so they are more secure and they’ll keep your feet in position no matter how intense your workout gets. This fitness equipment also features an S4 Performance Monitor which isn’t a lot different from standard monitors, and it only offers two programmes: time and distance. However, it provides different settings for you to achieve your fitness goals. Storage won’t be frustrating when it comes to the Water Rower Classic Rowing Machine because it folds upright and it has built-in transport wheels. After using the equipment, you can easily manoeuvre it to the storage room or place it somewhere convenient. With all the exceptional features that the Water Rower Classic Rowing Machine offers, it won’t escape some issues that have been noticed not only by me but also by some customers. 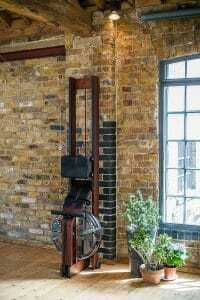 First and foremost, the price is in the high-end range, but this isn’t an issue because it makes a fancy addition to your home gym and it provides exceptional performance. 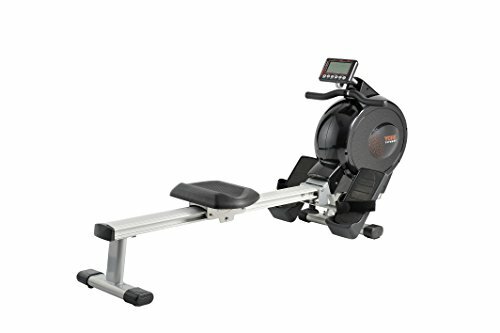 Another thing that I’ve noticed with this equipment is that it’s relatively larger than any rowing machine in the market so you would have to allocate more space in your home for this one. 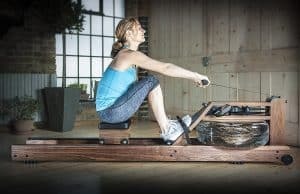 The Concept2 Model D Indoor Rower is also one of the most sought-after rowing machines in the market today. It also falls on the lower high-end price range, but it claims to last a lifetime. This rowing machine has a maximum weight capacity of 227kg, and it uses air for resistance. Just like water resistance, air resistance makes your workout harder by adding intensity as you row harder. It also has integrated advanced features such as a smartphone app compatibility, and it has an option to store your data on a USB flash drive. 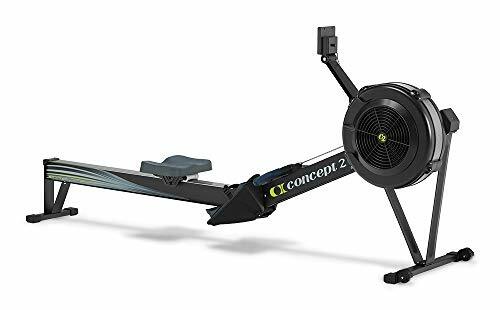 Concept2 Model D Indoor Rower Detailed Review? CLICK HERE. Easy-fold System, No Need to Kneel! The Bodymax Infiniti R90 Rowing Machine is also an excellent choice if you want to add a magnetic rower to your home gym. It’s a stable equipment with a maximum weight capacity of 120kg, and it can accommodate tall people with its long aluminium rail and wide foot pedals. The equipment also features a dual-coloured backlit LCD console which isn’t common in rowing machines. It comes with 12 inspiring workout programs, and it’s designed to provide a realistic feeling of rowing on water. Bodymax Infiniti R90 Rowing Machine Detailed Review? CLICK HERE. If you’re searching for a more budget-friendly option for an air rower, the Bodymax Oxbridge HR Air Rowing Machine might be the answer. It uses air resistance, but it has eight levels of intensity to ensure a well-regulated workout. 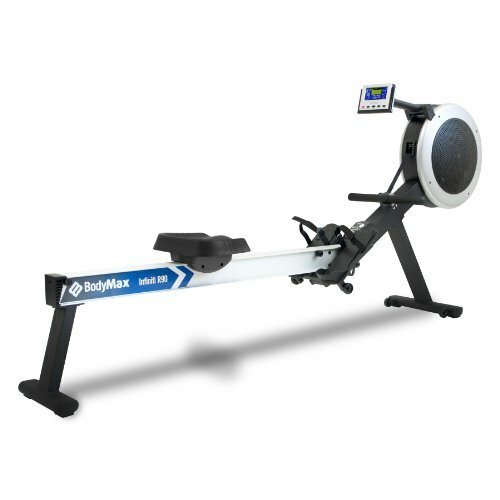 This indoor rower can hold users of up to 115kg, and it features a monitor with large fonts making it easy to read at any angle. It’s easy to assemble and it also effortless to store with a foldable function and built-in transport wheels as well. Bodymax Oxbridge HR Air Rowing Machine Detailed Review? CLICK HERE. 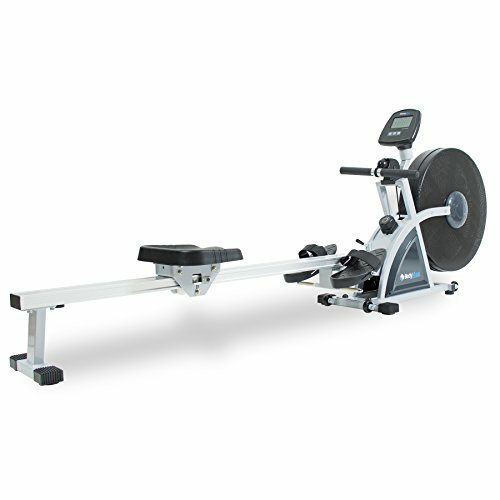 The York Excel 310 Rowing Machine is also an affordable alternative for high-end indoor rowers. It offers 16 levels of magnetic resistance, with the higher levels being difficult even for advanced users. That means it’s suitable for anyone, regardless of their fitness level. It also features a 5.75-inch LCD console which shows key workout information including workout time, speed, distance, RPM, stroke count and calories. It can hold users with a weight of up to 120kg, and it operates quietly with a smooth Kevlar belt drive mechanism. York Excel 310 Rowing Machine Detailed Review? CLICK HERE. I don’t think I need to say more. It’s obvious that the Water Rower Classic Rowing Machine is definitely worth an investment as you’ll reap its benefits for a long time. Instead of buying cheaper and replace it with another one as soon as it stops working. This equipment will not just help you achieve your fitness goals, but it also helps save the environment with its eco-friendly design and operation.